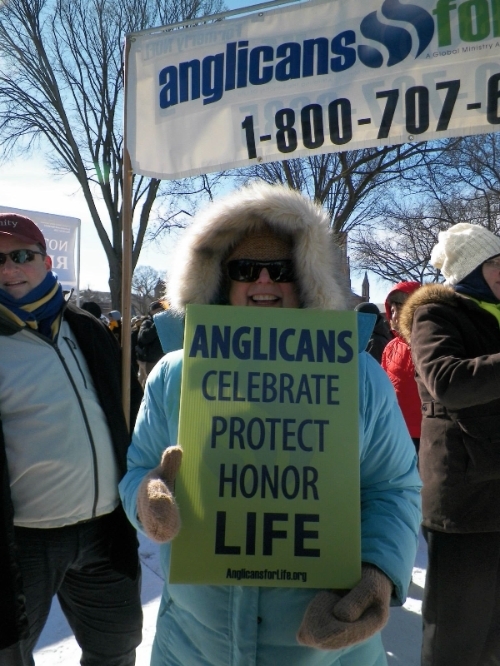 Thousands from across the nation, including bishops from the Anglican Church in North America (ACNA), braved the massive snowstorm that shut down major cities along the Eastern seaboard of the United States, and joined the annual March for Life on January 22, 2014, in Washington, D.C.
“I am honored to stand, along with my fellow bishops of the Anglican Church in North America,” said ACNA Archbishop Robert Duncan, “in recognition of the millions lost through abortion and to demonstrate our commitment to uphold the sanctity of life for all of God's children." Archbishop Duncan had flown back from East Africa to join the event. Following the landmark Supreme Court ruling Roe v Wade on January 22, 1973, thousands have assembled each year on that date to witness to the sanctity of human life. The Anglican bishops began their day in prayer by participating in the ecumenical prayer service at the National Memorial for the Preborn and their Mothers and Fathers at the historic Constitution Hall. 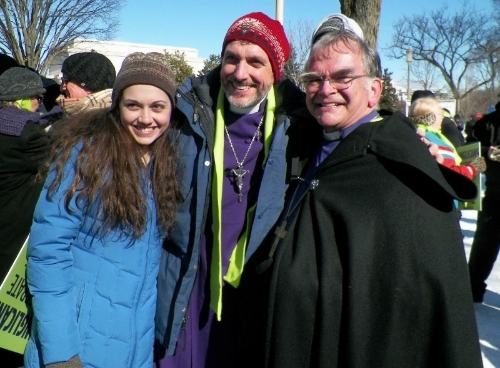 Following the service, the bishops gathered at the Institute for Religion & Democracy for brunch and then made their way to the Washington Mall for the March for Life and Rally. On the Mall, they were joined by other Anglicans, including members from All Nations DC (Washington, D.C.), Potomac Falls Anglican Church (Potomac Falls, VA), The Falls Church Anglican (Falls Church, VA), Shepherd’s Heart Anglican Church (Fairfax, VA), Truro Anglican Church (Fairfax, VA), and others. All were wrapped up in multi-layered clothes to protect themselves from the plunging cold temperatures, as they stood on the snow-covered grounds of the Washington Mall. A rally was held before the start of the march that included speakers such as Dr. James Dobson founder of Focus on the Family, as well as music from singer/composer Matt Maher. 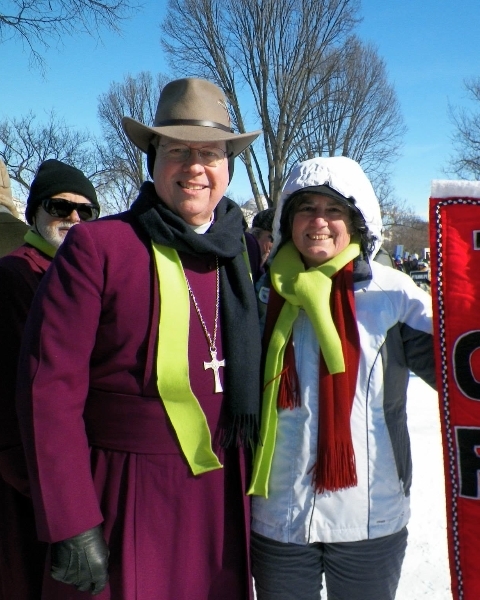 Also on the platform was Georgette Forney, President of Anglicans for Life and a founder of the Silent No More Awareness Campaign, where those impacted by the pain and grief of abortion share their personal stories on the steps of the Supreme Court during the March for Life. 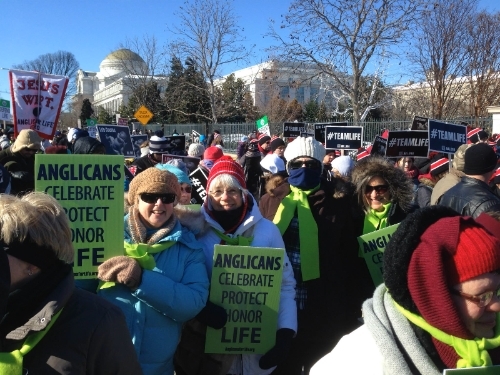 “A love of life—for lives of unborn children, elderly, and those most vulnerable—is a natural reflection of Christ’s love for each of us; it is not as much a requirement of Christian life as a privilege of it,” Georgette Forney wrote before this year’s March for Life, commending Anglicans to join their bishops and come to Washington. 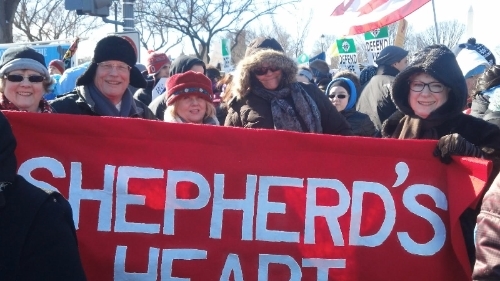 By 1:30 p.m. the March for Life was underway, with thousands walking up Constitution Avenue to Capitol Hill and to the steps of the Supreme Court. It soon became quite obvious that the overwhelming majority of those marching were under the age of 21. Carrying signs that said, “Team Life,” and “I am the Pro-Life Generation,” the young people marched knowing Roe v Wade has been in effect for their entire lives and it is their generation that has lost an estimated 55 million through legalized abortion in the United States. 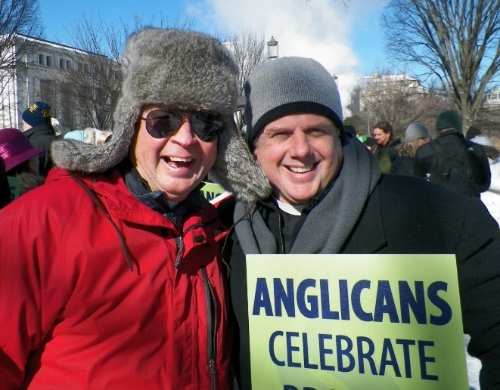 "It was a privilege to stand shoulder to shoulder with our Anglican brothers and sisters, as well as the larger Body of Christ, in contending for issues pertaining to life in our nation,” said the Rt. Rev. David Bryan, Bishop of PEARUSA’s Southeast Network, who had flown in from South Carolina. 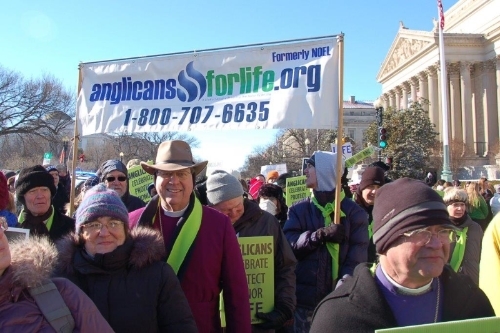 “It is encouraging and hopeful to see how well the younger generation was represented in the March for Life." 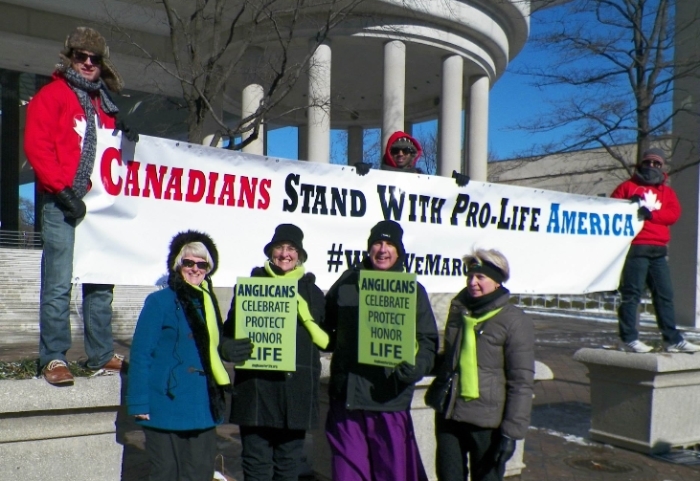 The Anglican marchers included ACNA Canadians who found public support for the sanctity of human life from fellow Canadians in front of the Canadian Embassy, prominently located right on the march route on Constitution Avenue. They all stood for a picture in front of their embassy, anticipating that they would see the Canadian-version of the March for Life on Saturday, May 8 2014, in Ottawa. 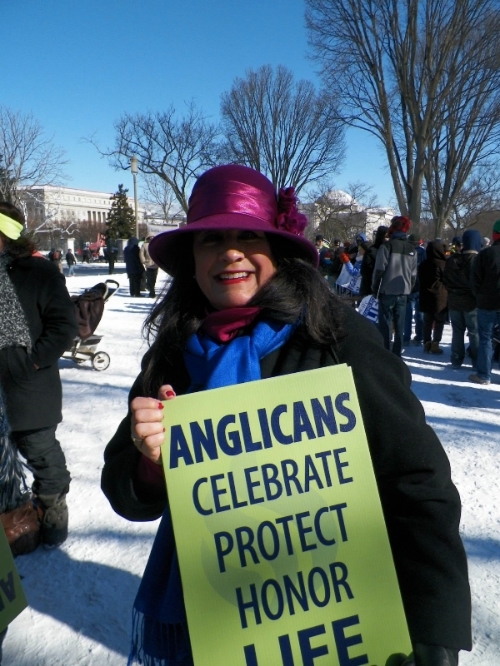 Mary Ailes is the Director of Communications for the Diocese of the Mid-Atlantic. Photos by Dennis Eagan, the Rev. Jeremiah Brown, and Mary Ailes.